In October, 2007 I was asked by Sr. Martha Ann Kirk to address a gathering of religion classes at the University of the Incarnate Word on the contemporary significance of Franz Jägerstätter, who was to be beatified by Pope Benedict the next day. Franz Jägerstätter was an Austrian peasant who refused to cooperate with the Nazi invaders during World War II, spoke vocally against the invasion of his country, refused to serve in the military and was imprisoned and beheaded for his actions and beliefs. Modestly educated at the local elementary school, it would be all too easy to dismiss him as a simple, uneducated subsistence farmer. He was more complicated than that. Jägerstätter was a self-educated theologian: he memorized the Bible, read spiritual books, tried to emulate the saints and took his honeymoon in Rome so that he and his bride could receive a papal blessing. He worked as the sexton at his parish church and often turned down the fees he was entitled to for digging a grave or preparing the church for a wedding, knowing his poor neighbors could ill afford to pay. He tried to live a consistent life. He refused all money or benefits from the Nazis. He turned down family assistance, to which he was entitled as the father of four young daughters and would not accept relief for crops ruined after a flood. On August 8, 1943 Franz Jägerstätter was beheaded. On October 26, 2007 Franz Jägerstätter will be beatified. Beheading needs no explanation – we are all too familiar with beheading. Beatification is a bit more arcane. Beatification is a process that the Catholic Church goes through in officially recognizing someone as an especially holy person. The French root beatus is also found the word beatitude, the part of the Sermon on the Mount where Jesus talks about those who are blessed. Blessed are poor, the pure of heart, the merciful, those who hunger and thirst after righteousness, those who mourn, the meek. Blessed are the peacemakers. It gets even more interesting when you consider that in Latin beatitude means happiness. Some Bibles translate blessed as happy. How can those who mourn be happy? “Blessed” in Matthew’s original Greek was makarios. Among the ancient Greeks and in the Greek translations of the Hebrew Scriptures, makarios took on several meanings. At times it referred to the gods and at other times to the dead: those who had transcended worldly cares. Later, it came to mean those looked upon favorably by the gods or by God: the elite, rich and powerful, who, in their own way, had transcended the cares and woe of the lesser people. At the time, Jesus’ list of blessed people was probably shocking, as it can be today if we pause to think about it. The poor, the meek . . . none of these are people that we think of having special blessings. In fact, they are people whom society usually pities or despises. In calling these folks blessed, Jesus was turning the conventions of the word and the world upside down. It’s not the rich who are blessed, or those who skip through life never facing adversity, or those who get earthly glory in battle. It’s the poor, the bereaved, the humble. Perhaps we are getting a little closer to an understanding of the concept of blessed: it is the contentment of knowing that you have done the righteous thing, even when it is inconvenient, or costly, or painful, or when it makes people laugh at you. 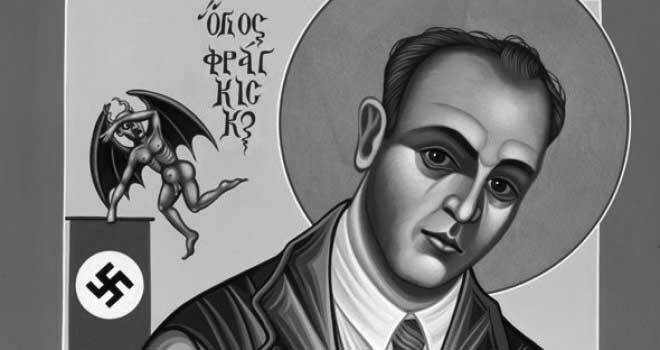 Tomorrow Franz Jägerstätter will be officially known as the Blessed Franz Jägerstätter, Martyr. The step after beatification is canonization, or adding someone to the canon, or list, of saints. Catholics and Protestants have several other differences in their concept of sainthood. In fact, we Lutherans are called Protestants – just another name for protesters – in part because Martin Luther protested the idea of praying to saints in the belief that they could intercede with god on our behalf. In his refusal to fight and kill for the Third Reich, Jägerstätter weighed the power of the state, of the government, of principality, might and dominion against his conscience, against what he knew to true and good and righteous and holy. In the weighing of faith against führer, faith won. To think, to believe, to suspect – to know! — that he was right and the state was wrong was only the first step in Jägerstätter’s journey, though. The second step in this journey was to act upon these beliefs. When people greeted him with “heil Hitler!” Jägerstätter responded, “Pfuii Hitler.” He openly talked about his opposition to the anschluss, the annexation of Austria. In the end, he refused to serve in the Wehrmact, the German army. There is yet a third step – to face the consequences. In Jägerstätter’s case, the consequence was death, death by beheading. This is why he is called a martyr. We now call this process, this particular form of integrity and courage, of refusing to comply with the demands of the state when our conscience tells us that it is wrong – Civil Disobedience. The term civil disobedience was first used by Henry David Thoreau in an essay called “On the Duty of Civil Disobedience,” which he wrote in 1848. I think it’s interesting that he didn’t call it the tactic of civil disobedience, or the technique or the option, but the duty. Duty. When our conscience and the state come in conflict, we have a duty, a DUTY to disobey. A couple of years after Thoreau’s important essay, the Reverend Henry Ward Beecher delivered a sermon which he called “On the Duty of Civil Disobedience to Wicked Laws.” I love the addition of “Wicked Laws,” because it makes Thoreau’s declaration clear: we have a duty to disobey wicked laws: not all laws, or inconvenient laws, or foolish laws, but WICKED laws. Everyone who knew and loved Franz Jägerstätter urged him to do his duty. But they meant his duty to his country, his duty as the provider and protector of his family, his duty to the community. He saw his duty and allegiance differently, as his duty to his conscience and his god. There are more than a billion Roman Catholics in the world. About one in four Americans was baptized into the Catholic faith. Every one of them, I suspect, will get to hear the story of Franz Jägerstätter this week. How will it be heard? To hold up a man who refused to fight, a man who defied the power of the state sends out a powerful political statement as well as a religious statement. There are peace churches in the world but the Catholic Church is not one of them. The Mennonites, the Society of Friend (known as the Quakers) and the Church of the Brethren all have as part of their theology a ban on war. It is understood that Quakers do not fight. Mennonites do not enlist in the Army. Followers of these religions have the unqualified support of their churches, their communities, and their families in their refusal to fight. The Roman Catholic Church is not a peace church. It has traditionally approached the dilemma of Christians fighting and killing in wars with what it calls the just war doctrine. In brief, Just War states that to be justified a war must be fought for just reasons and in a just, or a fair way. For example, a just reason would never include a preemptive strike. Fighting a war in a just way would always forbid killing civilians. In modern times, the Vatican has pretty much remained “neutral” in speaking out against specific wars and the participation of Catholics in those wars. I suspect that during World War II Catholics on both sides of the war were given similar advice to that given to Franz Jägerstätter by his priests and bishop: Go to war. Do your duty. Pray for forgiveness. I suspect that most Catholic soldiers today who may have doubts about the just-ness of our war on Iraq are still being given that advice. In World War I there were only 4 Catholic conscientious objectors registered in the United States. In World War II there were 139. During the Vietnam War, there were thousands. Did something change? I think that is part of the change in both the Church and the world: a realization that in this day and age NO WAR can be just. Let’s look at just one statistic: at the turn of the 20th Century, about 5% of war casualties were civilians. In the Iraq war, 95% of the casualties are civilians. According to the principles of just war, this is not just. Catholic social teaching is the principles that the church uses to guide its followers in living day-to-day in the secular world, in society. After reading the prophetic, anti-war words of recent Popes, the Catholic Social Teaching was a grave disappointment to me. In other words, the church is turning over its moral responsibility to give guidance on matters of war and peace to the secular leaders. In doing so, it gives into the authority of George Bush, which you may or may not agree with. But it also accedes moral authority to Adolph Hitler, to Saddam Hussein, to every dictator who ever raped, pillaged, slaughtered. Lest I sound inappropriately critical of a Church that is not my own, allow me to confess that Lutherans take a similar stance and I am equally disappointed in my own church. I can only hope and pray that the beatification of Franz Jägerstätter signals a change in this dereliction of moral authority and responsibility. Not all of us are called to be conscientious objectors. Not all of us are called to defy the state by committing acts of civil disobedience. But all of us ARE called to be saints, to be great souls, to be blessed, to take our faith seriously enough to make it active in the world. In a way, we ARE all called to be martyrs. The literal meaning of the word martyr is witness. We now take it to mean witness to the point of death, but witness in and of it self is a powerful expression of our faith. We can witness by speaking. The Quakers call it “speaking truth to power.” Even if, like Franz Jägerstätter we are the only one in our village who believes that this war is wrong, we can speak out. We can speak out and say that torture is wrong, that genocide is wrong. We can speak out and say that it is wrong that in the richest nation in the history of our planet that one third of the children in San Antonio live below the poverty level and that one in five of them have absolutely no health coverage. We can say that it is wrong the way we fail to care for the fragile ecology of our planet. We can be a witness to what our faith tells us is RIGHT. We can be a witness, a martyr of sorts, even when we are laughed at, or belittled, or told that we are naïve or crazy. We can look to the example of Franz Jägerstätter to give us courage to speak. We can also listen. When our friends, neighbors, family speak with that lone voice in the wilderness, we can listen to them, take them seriously, hear what they are trying to tell us. We can hold open the possibility that we do not know it all, that we do not possess all of the answers, that we have room to learn and to grow in both our faith and in our understanding of the world. This is what I think Jesus meant by “Blessed are the meek.” The meek, or perhaps humble is a more contemporary term, are those who do not exhibit the arrogance of certainty. The meek are those who are willing to listen as well as to talk. And we can, of course, act. Some actions are personal: We can examine how we live our everyday lives and bring them into line with our faith, with our beliefs. If we love animals, for example, we can refuse to eat them. If we believe in the dignity of labor we can refuse to buy clothing that is made in sweatshops. We can pay a little extra for fair trade coffee. We can refuse to buy or listen to music that exploits women. Some of the ways we can act are civic. We can vote for candidates that support positions that are in line with our beliefs. We can write to our congress people. We can be of service in the world by volunteering. We can stand in solidarity with others. We can all be blessed, we can all be saints.